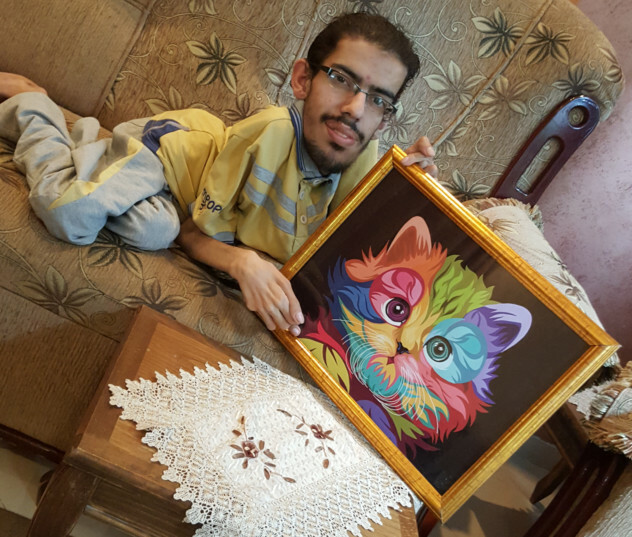 Gaza: Judging by his appearance one could quickly write off 24-year-old Mohammad Al Dalu as just a disabled member of society. However, this young man, has quickly become one of Gaza’s most prominent artists. 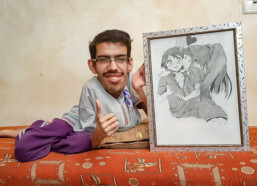 Al Dalu suffers from Spinal Muscular Atrophy, a degenerative muscle disease, but that hasn’t stopped him from pursuing his passion for animation drawing. Al Dalu was born with the disease where one of his hands and legs were shorter than the other, resulting in a muscle weakness and decreased muscle tone, limited mobility, breathing problems, problems eating and swallowing, delayed motor skills, spontaneous tongue movements and scoliosis. “Although the symptoms of my disease were extremely debilitating, I tried my best to move on in life without focusing on my disabilities,” he tells Gulf News in an interview. By the time he reached secondary school, his condition worsened and he became completely bedridden. Al Dalu said his father tried his best to get medical treatment for his son but the disease is incurable. Because Al Dalu could not play outside with the rest of the neighbourhood children, to keep him occupied and pass the time, his father gave him paper and pencils and asked him to draw. Little did he know that his son had an incredible talent. Al Dalu dove right in, using art to escape from his debilitating condition and release stress and pent-up emotion. Al Dalu specialises in animation art. He says he chose this art form as it was one of the less-tackled genres in Palestine. Watching Al Dalu at work is inspiring. His condition has left him largely bedridden so he requires special bedding to reduce the occurence of bedsores. Perched on his special spongy sofa he puts pen to paper. He doesn’t have full control over his hands and fingers but he manages with great concentration to hold the pencil with two fingers and move it across the paper. “I am overwhelmed with a sense of joy and happiness each time I finish a piece,” Al Dalu says. Al Dalu draws famous fictional charcters such as Aladdin and Mowkli as well as flowers, trees and animals with child-like expressions. He also also has some political art work. One of his pieces features a portrait of Mahmoud Darwish, a famous Palestinian nationalist poet as well as Palestinian resistance fighter Ghassan Kanafi and other pictures of children throwing stones against Israeli occupation forces. After establishing a collection of artwork, Al Dalu decided in 2015 to turn his humble home in the Al Nasir neighbourhood into an exhibit where he displayed around 500 pieces of his art. The exhibit, which he named “Animation is my life”, drew in hundreds of visitors from around Gaza. Having experienced two brutal wars in 2009 and 2014, Gaza residents saw the exhibit as a breath of fresh air and a welcome distraction to their dire conditions living in poverty and unemployment. Gaza has been under crippling Israeli siege since 2007 when Hamas took over control of the enclave. This means Israel controls every item that gets in and who can get in and out. This affects Al Dalu’s ability to travel outside to showcase his artwork. His work has been showcased in various regional exhibitions such as Egypt, Jordan and Saudi Arabia but Al Dalu wasn’t able to travel himself due to the blockade. Aside from restriction of movement, living in under siege means that sometimes it’s very difficult for Al Dalu to get the art supplies he needs to work like the white cardboard paper and colours pencils and chalk. Hanging on Al Dalu’s bedroom wall are several affirmations he wrote for himself including “Tomorrow is more beautiful” and “Your life is what you make it”. “Despite everything I faced, I never gave up. I developed my talent with the few resources and abilities I had,” he says.